You shall not murder, unless it is to murder Christians. Facebook is supposed to be a safe and welcoming place; it is an online forum where we can make out that our lives are better than they really are, and a platform for us to advance different causes that we are passionate about. As a result social media is filled with all the weird and sometimes wonderful thoughts of humanity. Over the years Facebook has been repeatedly called upon to ensure the safety and well-being of its users. Recently, the internet giant indicated that they would be doing more to remove hate speech and threats of violence, which was welcomed by many. Let me say, any speech that provokes violence against another should not be tolerated. It does not matter what religion, political party, gender, race, or sexual orientation people embrace, they should be free from threats of violence. Disagreement must be allowed, and freedom to debate different views and lifestyles needs to be protected, but threats of physical harm should not. But we seriously need to question Facebook’s commitment to protecting people online. Recently news broke about an American missionary being killed on a remote island in the Indian Ocean. Along with the news came all manner of comments and discussion, but then came the Christophobic comments and calls for the murder of Christians. I happened to come across one such comment on the page of news.com.au, in which the author says he wants to murder Christians. Believing this to be a violation of Facebook’s Community Standards, I decided to report it immediately. 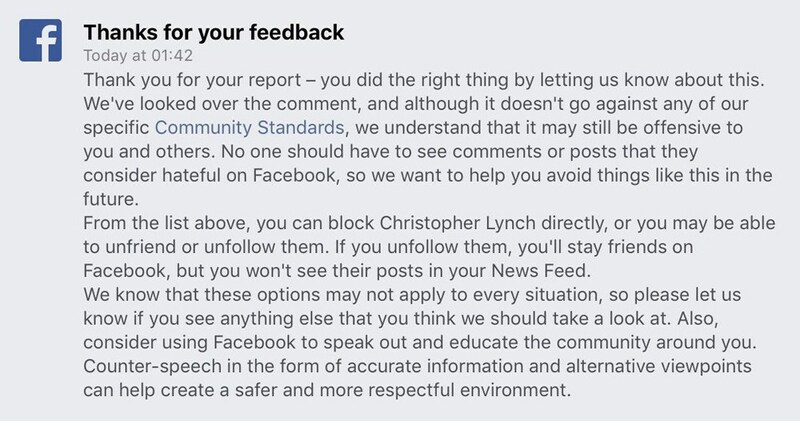 As I clicked the submit button, I thought surely Facebook would see the problem and act to defend its users. I mean, what company wants to be known to turn a blind eye to the threats of murder? Well, it appears Facebook is fine with Christians being murdered.